Preliminary data indicate that tourism as proportion of GDP amounted to 8.4% in 2016. 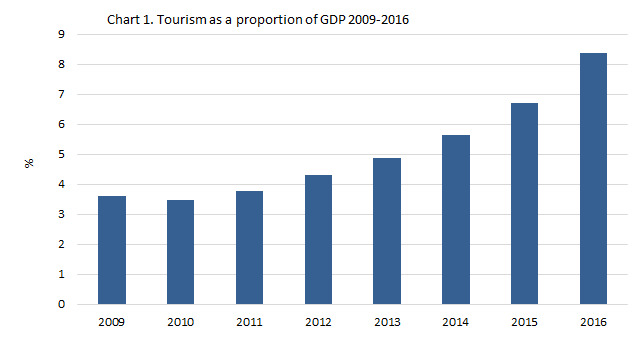 In comparison, tourism share of GDP was 6.7% in 2015 and 5.6% in 2014. For a fast growing industry, with constantly growing importance for the workings of the economy, it is important that the government, the public and stakeholders have access to timely and reliable information. By publishing preliminary data for the Tourism Satellite Accounts, Statistics Iceland seeks to fulfill users’ needs for timely information on the status and development of the tourism industry. Updated figures will be published in parallel with national accounts figures in March 2018. 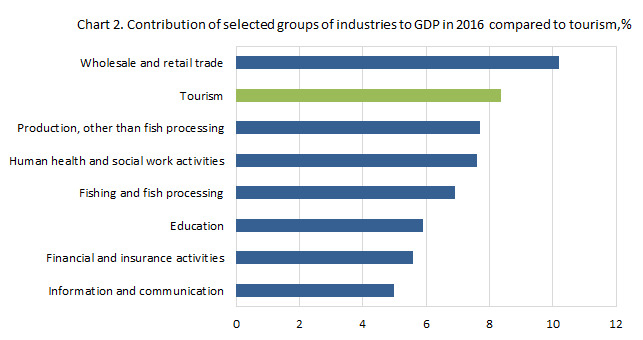 When comparing tourism to other industries’ share of GDP, one must bear in mind that tourism does not exist as an industry in standard industrial classification. Instead, tourism as an industry is assembled from a proportion of activities of multiple other industries. These statistics are part of the publication of Tourism Satellite Accounts which has been produced by Statistics Iceland in order to calculate the contribution of tourism to the Icelandic economy, based on international standards in tourism statistics. Data on the tourism proportion of GDP in Iceland has not been published before this soon after the end of the respective calendar year. In past publications, the timeliness was in large part limited due to the lag in which a few major data sources were available, notably data on enterprise accounts. Preliminary data on the tourism proportion of GDP rely on a wider range of sources.